New York hunter and jockey James Park owned a horse named the Duke of Duluth which he raced in steeplechase events beginning in 1912. Steeplechases were sponsored by hunting clubs. Considering the year, it is likely Park named his horse after the 1905 Broadway play. In New York, Park was considered “one of the best known of the cross-country riders hereabouts.” In 1915, he and his five-year-old Duke of Duluth, called by the press Park’s “favorite hunter,” won the Rats Cup at Wheatly Hills by three lengths. Two weeks later the pair took home the $300 prize of the Greentree Steeplechase Handicap. The following September, Park raced the Duke at Belmont, winning the seventh race of the Brook Cup Handicap Steeplechase. It was a lucky race for the Duke: falls by other riders put him into second place with just two jumps to go. After the final hurdle, he was even with the leader, Kehto, who he outpaced in the stretch. The Duke won by a length and a half. A few weeks later, the Duke ran in the two-and-a-half mile Autumn Steeplechase handicap sponsored by the United Hunt Association. He jumped out to a fast lead, and within the first half mile had left his opponents ten lengths behind. He held the lead for two miles, but in the last four furlongs, two of his contenders nearly caught him. 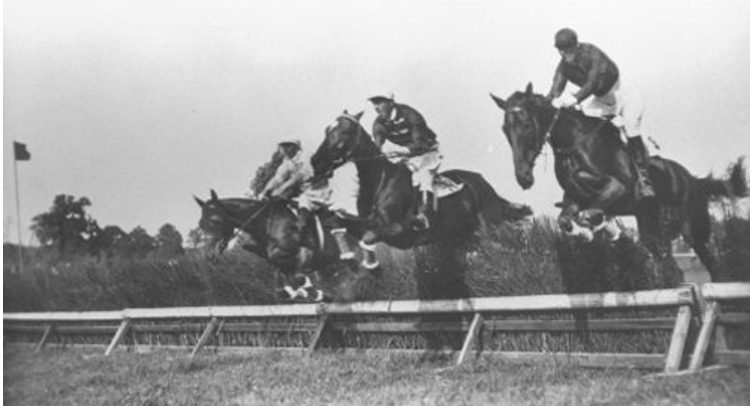 In what the New York Times described as “one of the most thrilling finishes seen in steeplechase in many years,” the Duke came across the line just a head in front of M. J. Shannon, who crossed a half-length ahead of Skibbereen. The Zenith City’s namesake took home both the Stone Gash Cup and a $1,000 purse after beating four other horses.